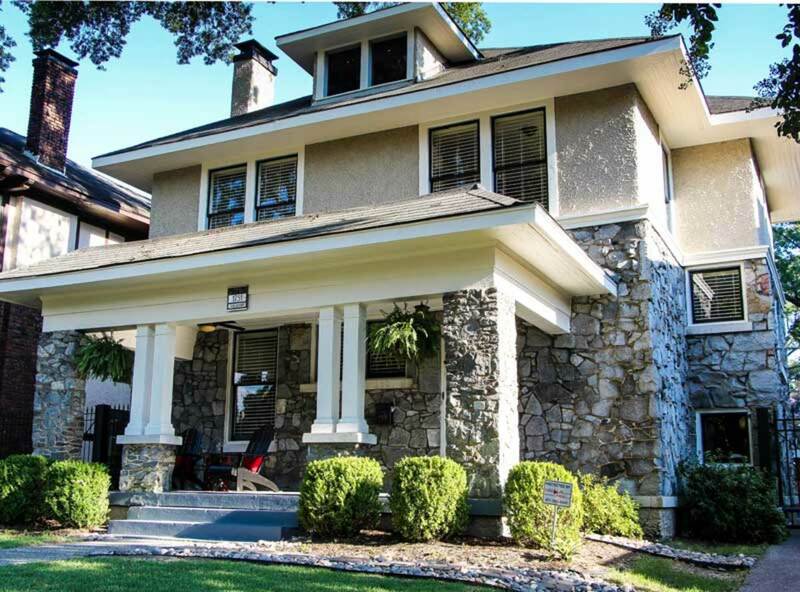 This American Foursquare in Central Gardens, Memphis, Tenn. celebrates its 100th birthday this year. The house, never neglected, was restored and gently renovated. Other Foursquares in the neighborhood are clinker brick and stucco or wood frame—this one stands out with its imported granite on the first floor. Our foursquare is in the Central Gardens National Historic District in Memphis, Tennessee. My husband, Greg Gentry, and I bought it almost two years ago, and projects are ongoing: We removed the recent prefab Greek-style front porch columns, and replaced them with 6x6 posts, then custom-built trim to match our interior newel post. We’re planning a detached garage with studio space above, much like historic outbuildings in the area. 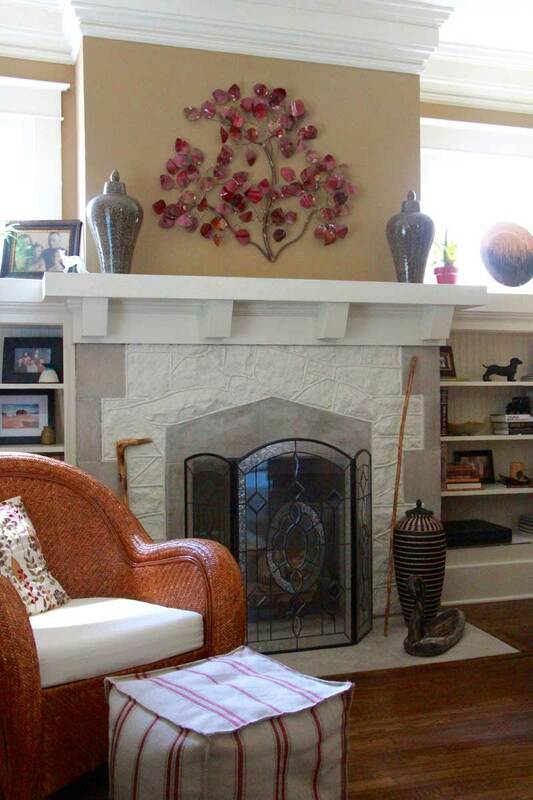 The Tudor-arch fireplace and mantel are original. We haven’t changed much inside, no tearing out walls or woodwork. I’ve decorated in a personal, updated take on Arts & Crafts style. The interior has the nurturing feeling of early 20th-century rooms. 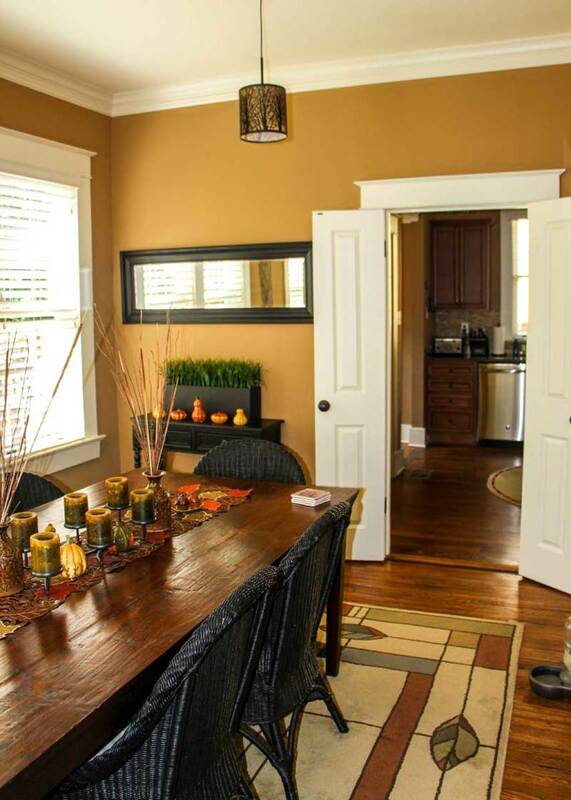 The caramel wall color, ‘Brush Box’ [8325D] from Sherwin–Williams, was already on the walls; I like its Arts & Crafts associations and how it complements the painted ivory woodwork. The dining room has a wool rug in a Prairie-inspired pattern, by Surya. We do use the rooms differently from the original plan. The old formal dining room is now our media room, separated from the front living room by the original pocket doors. A narrow back room is used as our dining room, next to the kitchen. The kitchen is in its original location, and a small powder room was added in what was part of the hall and a closet. We have a typical “half double” staircase—steps from the front room and another from the kitchen meet at a single landing, and one flight proceeds to the second floor. 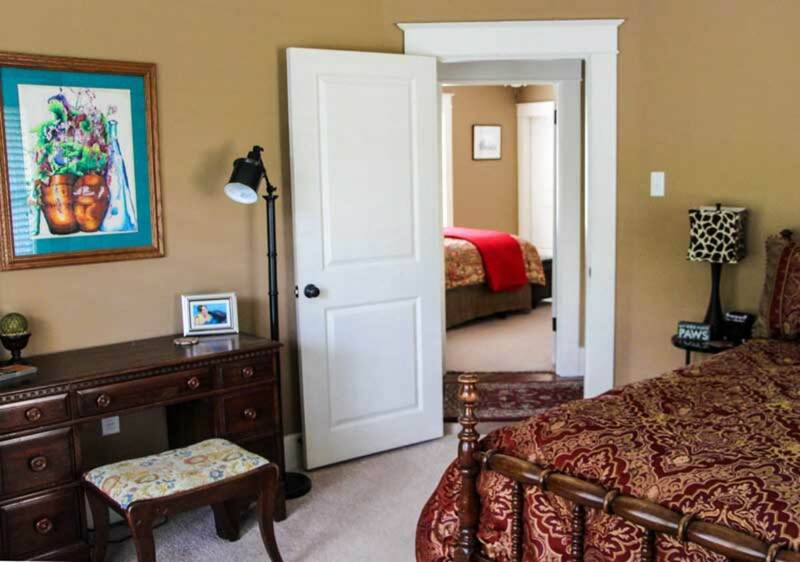 The guest room is furnished with Tennessee-made items, made in the 1920s and purchased at auction by the owner’s mother in the 1950s. 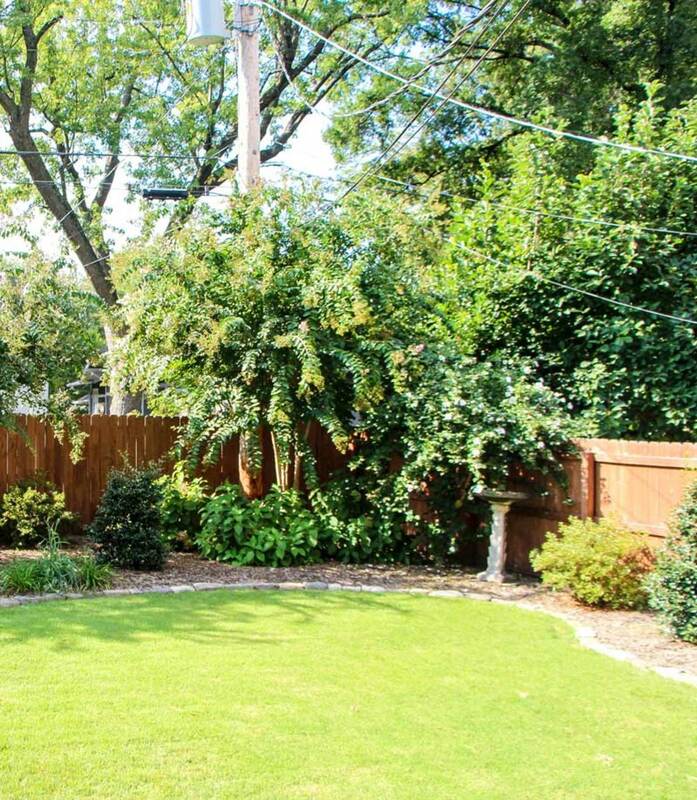 The backyard is small but nicely landscaped with an edged border between the grass and planting beds against the fence. It will soon host the outbuilding, its design approved by both the city and the Landmarks Committee. Before our ownership, the fourth upstairs bedroom was sacrificed to create a larger master suite with an upgraded second bathroom. A front bedroom serves as a home office. All the floors are original to the house, but, unfortunately, will have to be replaced at some point. They’re oak, but a kind of primitive “engineered flooring” in use during WWI when lumber was scarce. After a hundred years and several sandings, floors are paper thin. 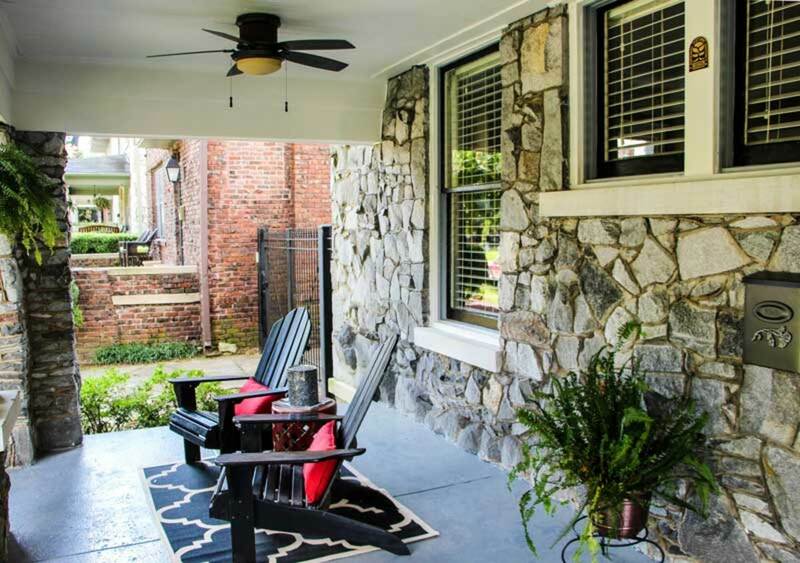 The big front porch is a great place to engage with the neighborhood. I love Arts & Crafts Homes magazine. My husband, however, says it gives me too many ideas of how to spend money on this house. Just kidding, he enjoys it, too! This is our dream house in our dream neighborhood, and we’re delighted to share it. The fenced backyard has an edged border. 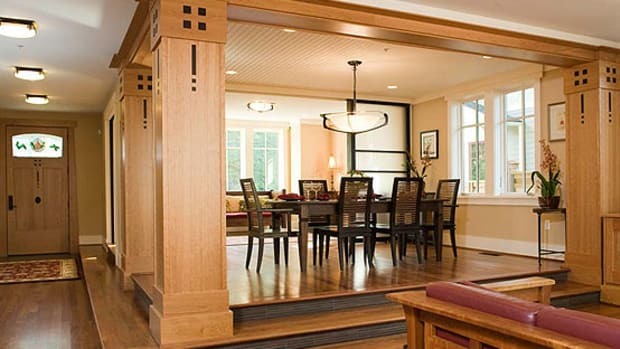 A sustainable Arts & Crafts Foursquare: a Maryland company finds inspiration for its high-quality, energy-efficient homes in the building traditions of the bungalow era. 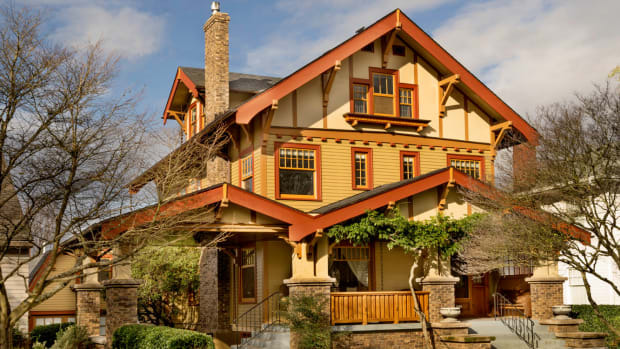 A passion that started with “trash night” in Brooklyn found full expression in the restoration of this 1911 house in Oregon. 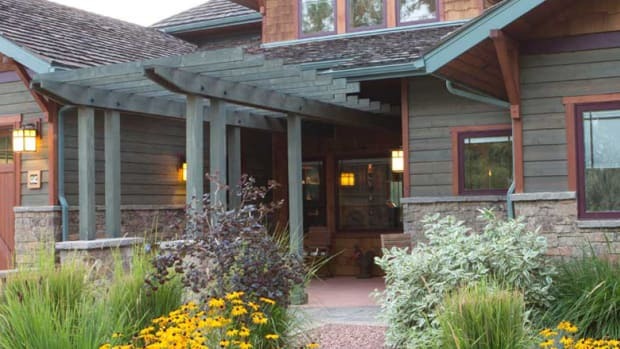 A transplant from Pasadena builds a Craftsman home in Great Falls, Montana, to local acclaim.